Below you can find highlights of some of our most recent public engagement activities. Watch this space for more highlights on our time engaging with different audiences at exhibitions, school science days, festivals, and more. 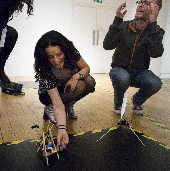 i-sense researchers from UCL and Imperial College London joined this month’s superbugs themed Science Museum Lates. 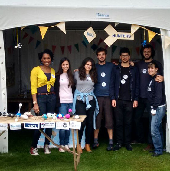 The exhibit, titled ‘The Ultimate Superbugs Race,’ was a collaboration between i-sense and students from the UCL Institute of Archaeology. On 13 and 14 March, i-sense members joined the Digital Health Technology Show at the ExCel Centre in London. The show is estimated to have attracted more than 4,000 people over the two days and gave us the opportunity to speak to some really engaged people, from those interested in the potential translation of our technologies, to students from various universities across the UK. On 21 February 2018, the EPSRC held a showcase at the Royal Society in London to promote the importance for EPSRC investments, in the context of UK prosperity. A number of EPSRC funded projects were selected to showcase their work as part of the visual backdrop to the event that also included panel discussions and debate. 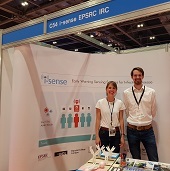 Researchers from i-sense joined the award winning show, New Scientist Live, as thousands of people visited the ExCel centre in London for a stimulating festival of ideas. This year marked the second year of the show, which featured five themed zones, including cosmos, earth, humans, technology and engineering. Sitting within the technology zone, the i-sense exhibit attracted a range of participants, from those excited to hear about our research into mobile healthcare and diagnostics for infectious diseases, to those wanting to be tested for the i-sense ‘Science Bug’. Researchers from the i-sense Llama Outbreak Control Unit were back again this year at Courtyard in Kings Cross, Green Man’s Welsh beer and cider festival, to track a strange disease spreading across London. 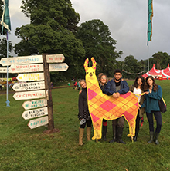 First seen in Wales during the 2016 Green Man Festival, Llama Outbreak! is a live game that aims to simulate the spread of an infectious disease throughout a festival. The project was produced by Einstein’s Garden, in collaboration with researchers from i-sense at the University College London (UCL) and funded by a Wellcome Trust Society Award. Through the Rosalind Franklin Appathon, we aimed to harness this digital revolution to reach out to a much larger global audience than traditional women’s networking events, and challenge cultural stereotypes. 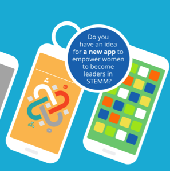 There is a growing movement in apps for social change but relatively few apps to empower and support women in STEMM, representing an opportunity for the UK to take a leading role. As thousands of people gathered at Einstein's Garden, a unique area of Greenman Festival that brings science to life through art, nature and interactive experiences, they came across a rather unique stall. The Llama Outbreak Control Clinic was set up in response to a public health emergency that had descended upon the festival - a strange virus that was turning people into Llamas! 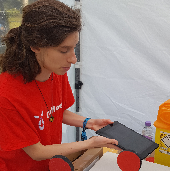 i-sense researchers invited the public to be scientists for a day at our "Bug Hunters" stall at this year's Spark Festival London at the Queen Elizabeth Olympic Park. Through fun, hands-on activities, we took visitors on an interactive journey for our hunt for bugs- to detect and identify infectious diseases much earlier than is currently possible. 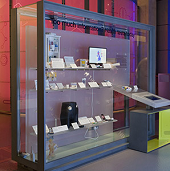 Our latest flu work features in the Science Museum's 'Too much information: Health tests today' exhibit from 29th June-29th September 2015.